Bancroft School is the oldest independent day school in Central Massachusetts. In 1900, a group of Worcester parents invited Frank Robson of Princeton, New Jersey, to head the new school. The School was named in honor of George Bancroft, a diplomat, Secretary of the Navy, and historian who was born in Worcester in 1800. Mr. Bancroft personified those qualities of scholarship and service upon which Bancroft School was founded. Outgrowing modest school buildings on Elm Street, the School moved to more spacious quarters on Sever Street in 1922, to a building which would accommodate the two hundred and fifty students who then attended the school. The following are links about The Bancroft School you may find interesting. Also check out the other pages. Bancroft School is the oldest co-educational independent day school in Central Massachusetts. The following are comments left about The Bancroft School from site visitors such as yourself. They are not spell checked or reviewed for accuracy. "Bancroft School is the oldest independent day school in Central Massachusetts. In 1900, a group of Worcester parents invited Frank Robson of Princeton, New Jersey, to head the new school. The School was named in honor of George Bancroft, a diplomat, Secretary of the Navy, and historian who was born in Worcester in 1800. Mr. Bancroft personified those qualities of scholarship and service upon which Bancroft School was founded. Outgrowing modest school buildings on Elm Street, the School moved to more spacious quarters on Sever Street in 1922, to a building which would accommodate the two hundred and fifty students who then attended the school. In 1958, the School moved to Shore Drive where today, a modern complex of buildings accommodates nearly six hundred students. Bancroft expects all members of its community to appreciate the importance of being responsible.The School also wants everyone to develop the habits and strength to act this way in everyday life.Learning to be responsible includes learning to: - respect and show compassion for others; - practice honesty as a matter of course; - show courage in upholding principles; - develop self-control in acting on principles; - maintain self-respect. These stated habits are especially important because many of the wrongs people commit result from a lack of sensitivity and compassion.None of us is born acting responsibly. A responsible character is formed over time. It is made up of our outlook and habits each day with respect to feelings, thoughts, and actions. People who are responsible act the way they should whether or not there is anyone to notice. They do it because they honestly believe it is right and because they have the courage and the self-control to act on their beliefs, even when tempted to avoid them." 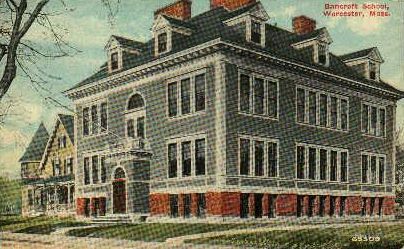 The old Bancroft school building at 93 Elm street corner of Sever street still stands. Became it was their first school in 1902, once a private home shown in picture. Does anyone have pictures of Winslow Street School and Sever Street School in Worcester which were both elementary schools in the 50's and 60's? Would love to see pictures of Winslow St and Sever St Schools Marcia. Will have to do some archive research to see if I can find something. Actually, the Bancroft School was located at 111 Elm Street and was demolished in the 1960's.